THE MAN WHO CAME UPTOWN. By George Pelecanos. Little, Brown. 263 pages. $27. Have you read the collection of Appalachian short stories Kentucky Straight? How about westerns by Elmore Leonard, or The Things They Carried by Tim O’Brien? Michael Hudson has. In fact, he has read everything Anna the prison librarian has suggested. Incarcerated while awaiting trial, he’s developed a bad reading habit. To him, a book becomes “… like a piece of art … It made him see what he was reading. It was how he dreamed.” When Michael leaves jail, he takes his habit with him, into a new life free of crime. Maybe. He’s free because a private detective named Phil Ornazian used a little extra-legal leverage to get Michael’s victim to drop the charges. He needs Michael’s skills as a “wheelman” for some over-the-legal-line activities he’s slipped into. He uses blackmail to get Michael behind the wheel of a car. Michael struggles, but picks up a job, and a lot of books. Tension builds between Phil and Michael. Then Michael bumps into Anna in the bar where he’s settled in as a staff member. Their bond carries over, and they meet a few times. Michael keeps up his reading habit, and Phil keeps involving Michael in his habit. Will Anna stay with her husband even though “Her heart wanted many different things”? Will Phil’s frenzy catch up to him? Will Michael be pulled into a life of crime he desperately wants to leave behind? So is this book. After you finish it, go back and read the MacDonald. Two great books. Two great writers. 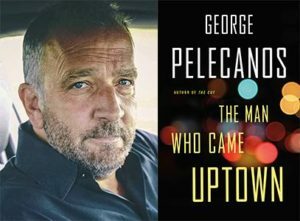 This entry was posted in Detective fiction, Popular fiction, Thriller/Suspense and tagged George Pelecanos. Bookmark the permalink.